Invoking the word "equity" is a lot like talking about Heaven. Everyone likes to describe it, but nobody seems to do what it takes to get there. Or worse yet, the word gets tossed around with no meaning whatsoever. It's become the trendy thing people have to say they want. And yet I struggle to find any meaningful incorporation of its principles into actual policy. When it does make its way into political decisions, equity seems to be applied only to giant, broad initiatives like raising the minimum wage or anti-bullying legislation. When the word is bandied about at community meetings, it doesn't seem attached to any specific actions at all. To me, putting equity into practice means being intentional about closing gaps based on race, gender, class, and other barriers. For instance, Minnesota consistently ranks near the nation's top in home ownership rates (currently #3) and yet we are also near the top when it comes to the gap between white and minority home ownership rates. Applying a lens of housing equity to a project like redeveloping Penn Ave N would raise this question: the Penn Avenue redevelopment initiative is likely to add more rental units than home ownership units through its rehab and new construction efforts. In context with Minnesota's home ownership gap, what does an equitable Penn Avenue plan look like when it comes to housing? Or are there other initiatives that should be coordinated with the Penn Avenue redevelopment as a result? West Broadway needs big ideas. The stretch along the south side of Broadway, from around Bryant to Emerson, needs comprehensive investment and change (as does Lyndale to Bryant, and almost every other segment along the corridor). Those two needs, however, do not unilaterally go hand in hand. At a West Broadway Coalition presentation tonight, Tim Baylor's Pinnacle Management group exemplified that specific dynamic. Pinnacle's proposal, called Satori, is to take every building on the south side of West Broadway from midway along Bryant (commonly referred to as "The Prayer Center Building" even though that tenant is long gone) all the way to Emerson, and tear almost all of it down. 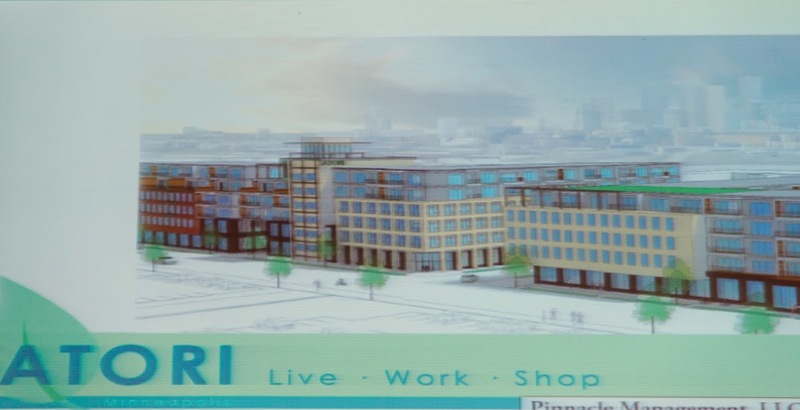 In its place would be first-floor retail, second-floor office space, and 2-4 floors of luxury apartments. The plan has its shortcomings, but I could still support it if it were on the north side of the street. The newly-proposed conservation district ordinance should excite me. Either the preservationist in me should leap for joy that neighbors may have another tool available to preserve the character of their community, or the libertarian in me should bristle at the prospect of fewer property rights. Instead, I'm left shrugging my shoulders and responding with a resounding "meh." 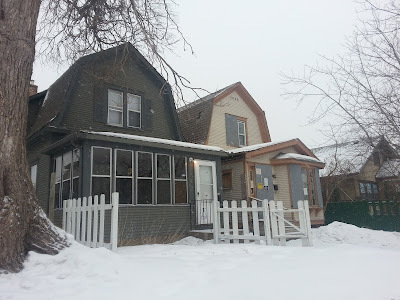 At the very first meeting when the idea was first rolled out, I had one question that would shape my assessment of this ordinance moving forward: How would a conservation district help north Minneapolis? And more to the point, how would it help "level the playing field" between neighborhoods where it's already easy to preserve houses and features vs. neighborhoods where doing so is continuously an uphill battle? Could a conservation district be used to slow or stop certain demolitions? And to bring it home to an area in need of preservation a block away from me, could a conservation district help The Endangered Dutch Colonials of Oliver Avenue North?